“We have almost finalised the scrapping policy for vehicles with NITI Aayog,” the road and transport minister said. Gadkari said India is bound to become the hub for the automobile industry and the prices were bound to be cheaper as scrap could be used for the production of auto parts among other things. “Raw material for vehicles will be cheap … plastic, rubber, aluminium and copper – all generated from scrap will be used for auto parts generation besides other things,” the minister said. As per an earlier proposal, a relief of about Rs 5 lakh was to be provided to people who purchase a new commercial vehicle of about Rs 15 lakh, if they surrender their over 15-year old commercial vehicles. 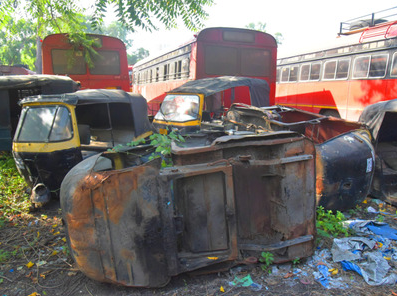 It`s will be good move to ban 15 years old vehicles from city to scrape yard in it to recycle factories., this policy most needed much earlier. Yes, very true, I agree with this good move, but the Govt should stick to only Public Commercial vehicles. Scrapping of private vehicles above 15 years will render thousands of lower middle class as well as the poor classes who own small old cars, motorbikes and scooters without any transport, especially in small towns & villages. Next Next post: Hint of new Aadhaar deadline?